Dr. Michael Miller, associate professor of radiology and imaging sciences, is focused on simplifying work flows with efficient technology. 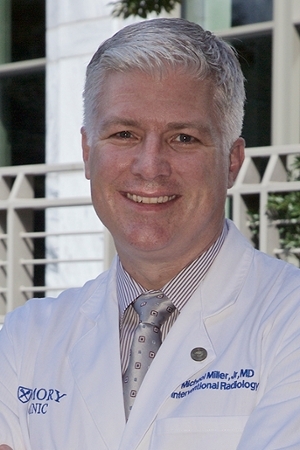 Dr. Michael Miller, associate professor of radiology and imaging sciences, talks as if breath is as limited as time. It may well be, given that he is the new director of interventional radiology and image-guided medicine, charged with leading the division through a rapid growth spurt while simultaneously overhauling its operating systems. He’s well-suited for the challenge, almost made for it, even if becoming a doctor was somewhat accidental. Medical school at Hahnemann University in Philadelphia validated Miller’s conviction. Until third year.